Ever since its launch in 1988, the Suzuki Vitara has seen numerous changes in performance, size and style. In its latest incarnation, the Vitara is better than ever, bringing a balance between great road performance, off-road capability and distinctive style. 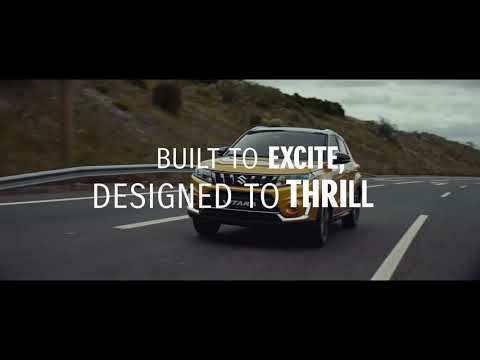 With its rugged SUV style and spacious interior, the new Vitara is a beautiful car that means business. Take control of the road with the ALLGRIP 4-wheel Drive System and the Radar Brake Support, which senses other vehicles and brakes automatically. Get comfortable with the high driving position, generous leg room and intuitively designed dashboard. The Vitara imposes itself and leaves a lasting impression anywhere it goes, thanks to its rugged body styling and complementing details, such as the bulky front bumper and eye-catching chrome grille. Adding to its modern flair are the sleek LED headlamps and striking alloy wheels. On the inside, space and comfort reign supreme, with plenty of head and leg-room available for everyone. Practical as well, the Vitara can hold up to 1,160 litres of luggage when the rear seats are folded. The outgoing 1.6 petrol engine is replaced with either a 1.0 Boosterjet or a 1.4 Boosterjet engine, providing more power and efficiency with all diesel models now dropped from the entire Suzuki range of vehicles. The ALLGRIP four-wheel drive technology makes it easier than ever to go off-road by offering the traction you need, when you need it. Available in three trims – the SZ4, SZ-T and Kuro, which is Japanese for “Black”, the Vitara comes packed with features by default. This includes 16’’ alloy wheels, silver roof rails, LED daytime running lights, DAB radio with Bluetooth, cruise control and automatic air conditioning. The SZ-T tops up the list with a satnav and 17’’ silver painted alloy wheels, while the Kuro adds exclusive choices such as a panoramic sunroof, auto headlights and wipers, keyless entry, black front grille and radar brake support. Having been awarded a five-star safety rating by Euro NCAP, the Vitara comes with plenty of technology in addition to the standard seven airbags. You will rest assured on each journey, knowing that features such as ABS with Brake Assist Function, side impact protection beams, Hill Hold Control, Radar Brake Support and a Tyre Pressure Monitoring System will be looking after you. Get in touch with Hardie of Stirling today to book a test drive with the latest Suzuki Vitara and to find out more about our offers and finance options. You can reach us by phone on 01786 451616, or by completing an enquiry form.